I haven’t gone to many Mariners baseball games in recent years. Until last weekend, the last time I was at Safeco Field was almost two years ago. The year before, my brother-in-law Jim had won an employee contest that had allowed him to pick a game the next season for which he would have full rights to a suite. He chose a Saturday night game on July 2, to celebrate his and Tamara’s 20th anniversary, and invited the family. (I wrote about it here.) That was our lone game that season, and then we managed to let last season pass without a game. I’ve already written about the game we went to last weekend, in the context of its being Felix Hernandez bobblehead doll night. What I didn’t explain is that we had Diamond Club tickets. This was our friend Judy’s idea. Judy and her family have had season tickets behind home plate since 1977, the Mariners’ first season. We’ve been fortunate to join Judy for many games, both at the Kingdome and at Safeco. The seats are maybe fifteen rows back from the field. The last couple of times we went, I noticed that people seated in the first few rows had food served to them at their seats. I didn’t know what the deal was. Now I do. It’s the Diamond Club. What Judy suggested to Gail is that we choose a game for which she had tickets and she would trade them in for Diamond Club seats. The Diamond Club consists of the first eight rows behind home plate in the two sections immediately left and right of the line that runs from the pitcher’s mound and home plate straight into the stands, as well as the first eight rows of the two sections just left and right of these two. (The outer two sections run into the sides of the dugouts, and so aren’t very wide.) But more than that, the club consists of the space under the stands in these sections, with a restaurant, a bar, and more. One enters the club from outside by going to the ticket takers at the southwest corner of Safeco, walking through an area that leads up to the stands, and then showing tickets again at the club entrance in order to be admitted. Inside the door, you are greeted, given an overview if you haven’t been in the club before, and shown to a restaurant table. It’s buffet eating, but first you can order drinks at your table before heading to the food. Everything, I should add, is included in the price of the ticket. And these tickets aren’t cheap, though Judy pointed out that one could pay almost as much just for the seating in the stands, so it’s a pretty good deal. One doesn’t have to eat and drink to excess to feel like one has gotten one’s money worth. The buffet is set up in an upper level surrounding restaurant tables. Then there’s a lower level with the bar, booth seating along a wall (where we were), and still more seating down around the bend. We ordered our drinks, then took our plates and headed back up to see what our options were. At one table, a man was making crab cakes in a frying pan. At another, there was mashed potatoes, asparagus, and barbecued ribs. Maybe fish too. I have to say, I should have written this post a week ago. I’m forgetting. Next, there was a man carving turkey and slicing meatloaf. Around the bend, on another wall, was Caesar salad, an array of fresh and roast vegetables, fruit, potato chips, and lots more. Then came desserts, which we didn’t look at closely until later. One table had a chocolate fountain with bananas and strawberries for dipping or coating. And along a counter were seven or eight cakes and pies to choose from. Hard not to eat to excess. And from our booth, we could see a large grab-and-go center for people to get food to bring to the stands, or to come in from the stands for. Bratwurst, pizza, pretzels. And about a dozen candy dispensers on the wall. There was a refrigerator behind our booth. It took me a while to realize that this was for our use too, filled with water and soda. This is all near one of the openings to the stands. By the next opening was a popcorn station, with hot butter too. And the next opening had boxes of candy of various types along with a soft ice cream dispenser. Oh, back by the brats and pizza were bags of caramel chocolate popcorn and some other type of popcorn. It’s really too much. Game time was 7:10, with the club opening a couple of hours ahead of time. We were there shortly after opening, and at our seats an hour ahead of game time. The seats were in the seventh of the eight Diamond Club rows, about six to eight seats in from the center line. Which means we had a pretty darned good view of everything, including all the people milling around behind home plate for the pre-game activities. A boy and his dad who would go out to centerfield to catch balls shot from a machine in order to win assorted prizes. A boy who threw a ceremonial first pitch. Later, a group of kids from some school in Federal Way who were marched out just in front to sing the Star-Spangled Banner. But before all that, we caught the tail end of Rangers batting practice, with Rangers manager Ron Washington leaning against the batting cage watching his charges. And did I mention the food? Yes, we could go back in any time for the grab-and-go offerings. But we also had menus at our seats from which we could order burgers, hot dogs, ice cream, drinks, and more, which would be brought to us by the next half inning. The sandwich special that night was a cheesesteak that I had my heart set on when we read about it on arriving at the club. However, after the dinner we ate, it simply wasn’t possible. I did eat some of Gail’s chocolate caramel corn. And I couldn’t resist grabbing a box of gummy bears on our way to the seats. That pretty much did me in. No cheesesteak for me. The game? Oh yeah. We didn’t pay just to eat. We paid to see baseball. And so we did. 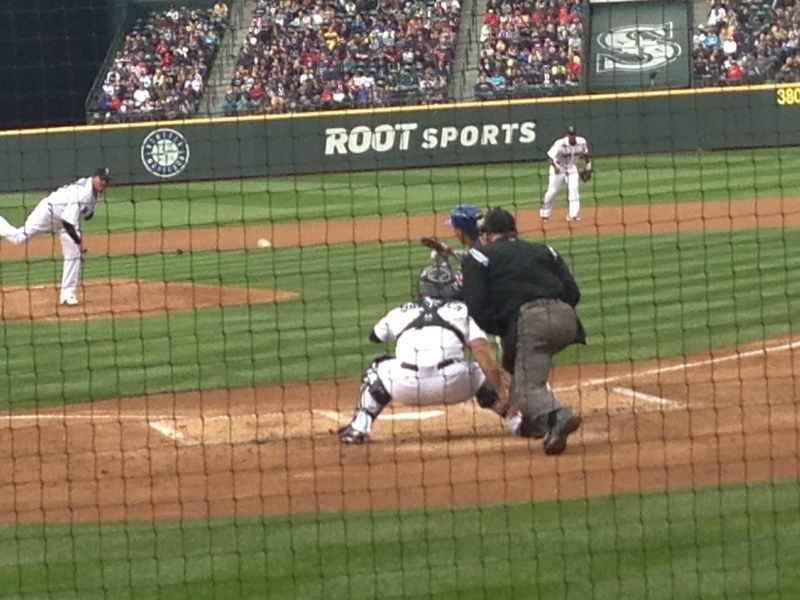 There’s Felix Hernandez, at the top of the post throwing a pitch. The photo gives a better sense of where we were seated than my words provide. Great location. But Felix had an off night, was hit hard, and we lost. A bleak game. Plus, a totally unrelated issue arose in an early inning and I found myself distracted for about two innings in a series of texts with Joel, despite his protestations that I should just enjoy the game and get back to him afterward. I don’t imagine we’ll be getting back to the club soon. When we do—if we do—I might go for the seats farthest away from the center, over by one or the other dugout. For one thing, they’re just far enough off center to be beyond the screen that protects us from foul balls, offering a clearer view. A first- or second-row seat there would be pretty cool. And I might space out my eating better, so I’ll have room to eat the sandwich special at my seat.